Excellent trip on a gorgeous day, a great time on the mountain. Road almost bare all the way to Paradise. Chilly, no wind. Firm layer of snow on top of softer stuff, snowshoes needed to avoid potential posthole. Very firm climb up to Panorama Pt. All used microspikes on the steep slope up - it was hard and crusty and icy in places. One person did not have spikes, so I loaned mine out and used snowshoes the whole way. I recommend snowshoes with good traction, such as MSR or other with lots of teeth, not Tubbs style. The slope up to McClure Rock was very hard snow mixed with ice. But we took our time and had no trouble. Ice axes were used on all steep sections of the trip. 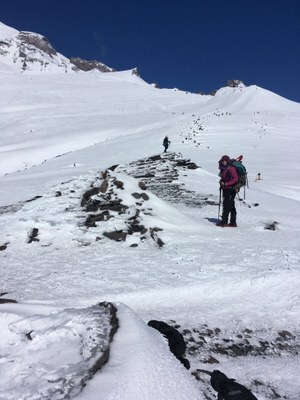 Lots of people heading to Camp Muir, but we had McClure Rock to ourselves. Crampons would have been better than spikes. Snowshoes were difficult to use on the steep descents, but doable. Beautiful sunny windless day, needed serious sunscreen!